On November 17, many of us enjoyed the performance of DakhaBrakha that was held in Strathmore Music Center. United Help Ukraine had been invited to participate in the pre-concert panel discussion and was represented by board members Marina Baydyuk and Oleksandra Pavlyuk. The topic of the discussion was “The Path of the Artist in Times of Conflict”. 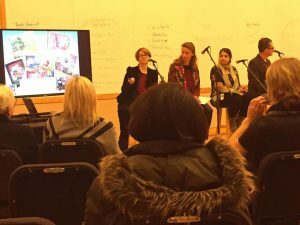 We told the audience about the role artists played during the Maidan revolution. We talked about Russia’s war in Ukraine, and how artists in Ukraine and here in the US have been taking part in numerous charitable concerts and art auctions to raise funds for the wounded. United Help Ukraine have organized a number of such charitable artistic events. While organizing the events, we strived to promote Ukrainian culture and artists. The role of the artist as cultural ambassadors was discussed vividly, with DakhaBrakha taken as a perfect example. There were many questions from the audience about political situation in Ukraine. The discussion touched upon challenges artists face due to the hybrid character of the war and the role of the artists as public figures. 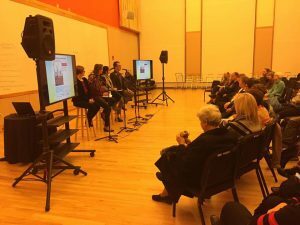 The audience reacted with questions and lively interest, and seemed to become energized and prepared to hear the concert. The informal discussion continued for at least another hour in the Strathmore café and the hallway right after the concert. This entry was posted in Raising Awareness and tagged artists, concert, Maidan, music. Bookmark the permalink.